Most exhaust manifolds are composed of either cast iron materials or stainless steel materials. The exhaust manifold is a part of your car which is responsible for gathering the engine exhaust and sending it through cylinders and out the exhaust pipe. The more cylinders a car has, the more fuel combustion there is which makes a car perform better. The exhaust manifold plays a major role, and one of the components that makes up for this important part of your car is the exhaust manifold gasket. A blown exhaust manifold gasket can pose many problems for your car and can make it not suitable to drive for even a short distance. Once an exhaust manifold gasket gets blown, carbon dioxide (very dangerous) gets released rapidly, so it’s a must to replace the gasket immediately. The main sign that the gasket has blown is that you’ll notice what sounds like air escaping from your engine bonnet. Usually the sound is much easier to here while your car is idling. If you’re observant, you may be able to spot the issue before the gasket actually blows. There are ways to test if your exhaust system is leaking. It’s essential to keep an eye out for such things to help prevent any serious issues with your car in the future. You don’t want your car to pollute the environment with carbon dioxide as it’s very dangerous, so monitor your car sparingly. You can easily identify a leaky exhaust if you know how to spot it. You just have to listen for the sound of a leaky exhaust. 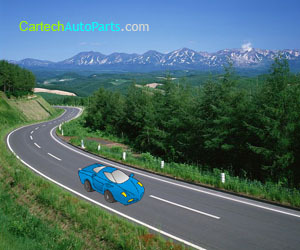 However, determining if the sound is actually your roaring engine, or the leak, is somewhat difficult. You can purchase a stethoscope made for automobiles at an auto parts store, and they’re not very expensive. This device will help you with separating the different sounds coming from under the engine bonnet. If you’re attempting to identify noise from your exhaust system, you should swap the stethoscope’s solid probe section with a long and narrow pipe or tube. This will help you hear a sound of gas that’s escaping with a rushing force instead of any clunky sounds from parts moving around. Move the pipe or tube around the areas where two major parts of the exhaust system are connected and try to hear any gas escaping. Make sure you’re careful that you don’t go near the spinning belts or extremely heated areas. By using this customized device, you can easily hear even the most minor exhaust leaks from under your engine bonnet. While the escaping gas could be caused by rust holes in your muffler (caused by condensation) or a few other defects, its most commonly related to the exhaust manifold gasket. After you run the test provided in this article, or if it’s blatantly clear that gas is escaping, you will want to replace your exhaust manifold gasket with a new one. Make sure you don’t procrastinate as this is an issue that needs fixed immediately. You’ll have to wait for your engine to completely cool down before you start the guide. Once it’s cooled off, you can loosen any nuts or studs that are connecting the cylinder head (of the car’s engine) to the exhaust manifold. If they can’t be loosened easily, you could use penetrating oil or fluid to help deal with the studs. If the threads are extremely corroded, it’s suggested that you let a licensed mechanic take care of the job. After the connecting pieces are detached from the manifold, you should be able to remove the exhaust manifold. If you’re having problems pulling the manifold out easily, look for anything keeping it connected to the exhaust system. Once any other pieces are removed, you will be able to remove the manifold with no problems. You’ll also want to clear out everything from the bad gasket and clean up the areas where the manifold attaches so your new exhaust manifold gasket can attach and seal smoothly. Once you remove the old gasket from the manifold, you can attach the new one. Afterwards, reinstall the manifold into your car and tighten the nuts and studs based on the factory torque specs. You may also want to use an anti seize compound on the stud threads to help prevent future corrosion and make removing the parts easier in the future. After you have finished the guide, it’s time to check if you did a good job. Make sure you completed the swap properly by grabbing your customized stethoscope and testing for a leak from your exhaust manifold gasket. Are the layers in an exhaust manifold gasket press fitted, held by adhesive or resistance welded? If press fit, what kind of tooling is used?